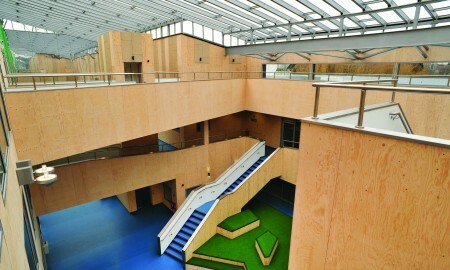 Part of an £18m new building at the St. Albans Academy in Birmingham, this project involved creating a large abstract design roof, that spanned two buildings, which introducing light and complimented the other architectural design, as well as creating and installing a unique balustrade system. 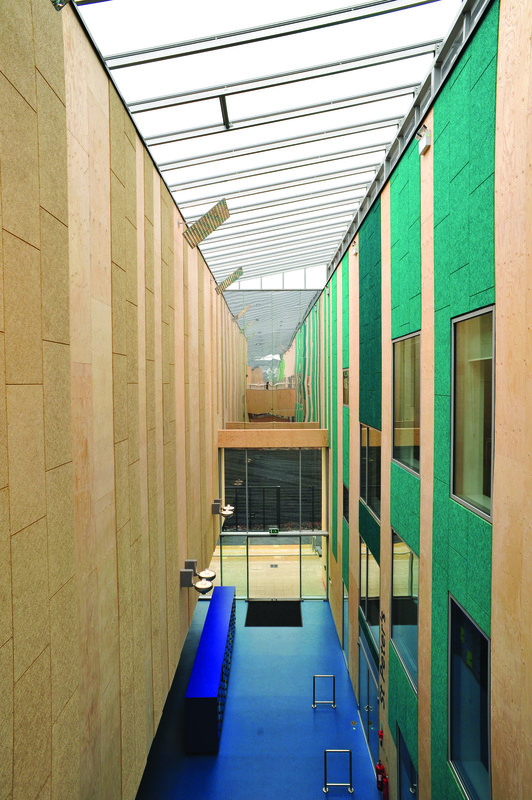 The atrium roof consists of three different widths across the two buildings, and consideration was made for future access and security whilst providing unparalleled aesthetics to this Birmingham BSF project. 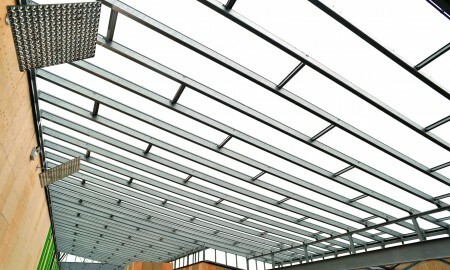 The steel glazing bars accompanied with polycarbonate sheeting provide the primary structure, with complimentary aluminium flashings and guttering giving a pleasant finish. 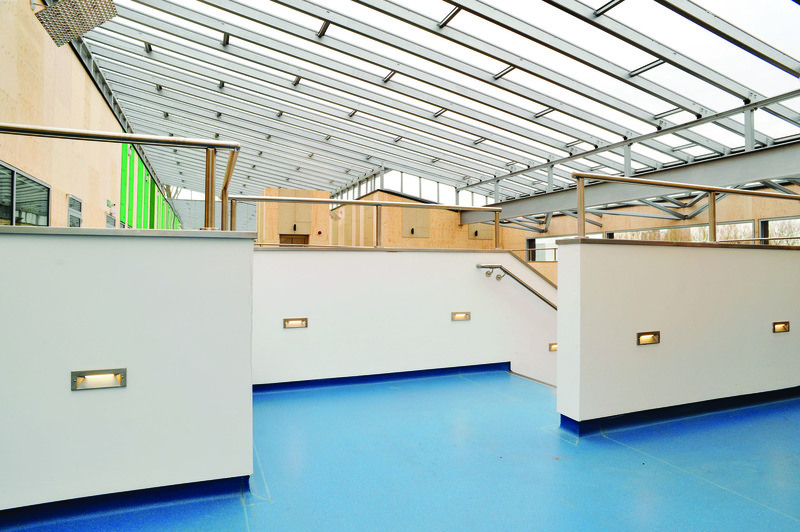 As part of the final stages of the roofing installation, a roof top walkway was installed without obstructing the light into the building, along with grating soffits fitted to aid in air flow. Of course the roof installation is only half the story with this installation. We were also asked to create and install a custom balustrade railing solution, which fit the buildings unique styling and future aspirations. The installation consisted of 7 different types of custom made balustrade were used across the total length of 195m, capping each with a bespoke stainless steel cap. 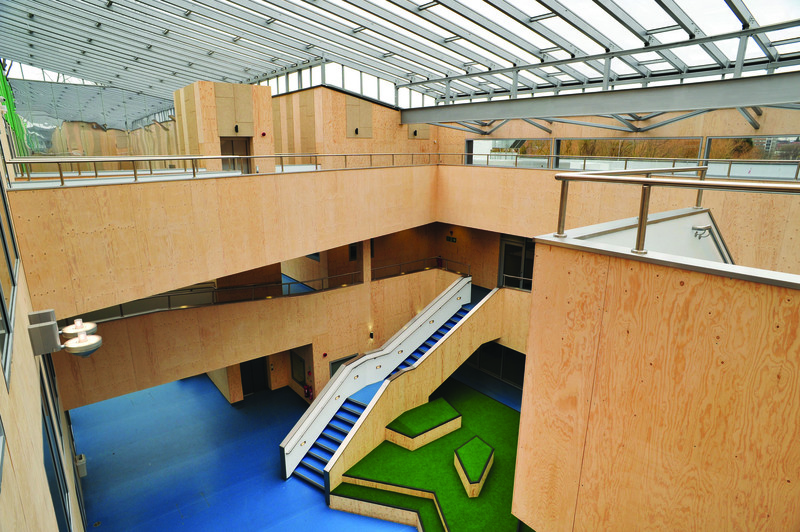 Broxap were awarded a subcontract in March 2012 that involved the design, manufacture and installation of a bespoke, value engineered roof structure to cover the interstitial atria at the St. Albans Academy in the central Birmingham district of Highgate. The subcontract (sum circa £210,000) was part of the Birmingham BSF programme, for the Birmingham City Local Education Partnership. Broxap closely collaborated with the client, principal contractor (Lend Lease EMEA), their consulting engineers (Nolan Associates) and the project architect (de Rijke Marsh Morgan). 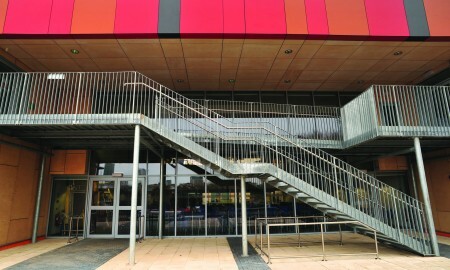 A final design was created that was constructed of an amalgamation of ‘primary’ mild steel beams and trimming steelwork, extruded aluminium rafter bar system, supporting 8mm clear polycarbonate roof sheets. Broxap overcame many challenges to bring this project to completion, with specific emphasis on employing access and construction methods, which ensured that the structure could be erected accurately, swiftly and safely at a high level. 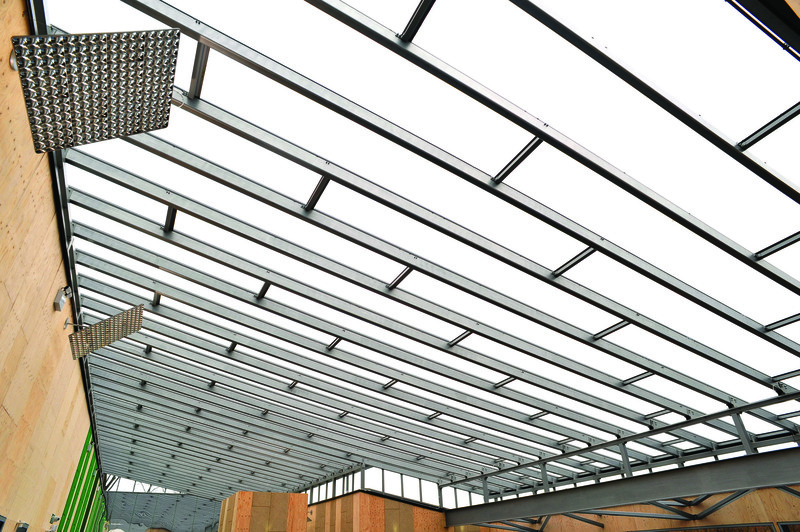 This involved accurately integrating the roof structure with the primary steelwork of the building, by lifting, locating and fixing the heavy steel components accurately within a confined space and limited access. There was specific emphasis placed upon the requirement to ensure that structure was set out accurately, and in a manner that maintained the integrity of the building, from a structural perspective. The designs were verified using a consulting Structural Engineer, at which point setting out the structure using a total station (electronic/optical instrument used for modern surveying) could begin. After locating the roof structure, Broxap began ‘mag’ drilling and welding the component parts, to the existing skeletal steel structure to create points of interface where the two structures were to join. This was completed using a combination of Articulated Boom Lifts and Scissor Lifts. A 90 Tonne all terrain crane, equipped with a fly jib, capable of distributing 500kg at a radius of 45m, was used for hoisting the heavier components into location. 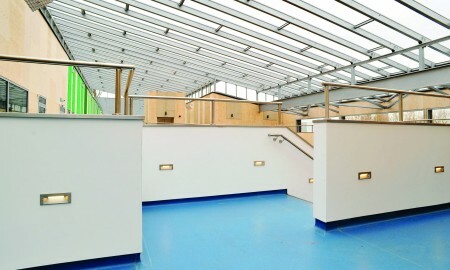 These were then secured by using the Articulated Boom Lifts and Scissor Lifts. 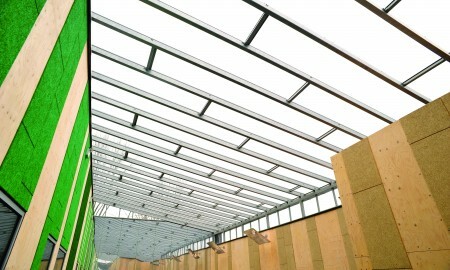 To install the glazing, and glazing bar system in the same manner as the ‘primary’ mild steel and trimming steelwork, would have been time consuming and impractical. To overcome the logistical challenge, Broxap commissioned a working access specialist to develop and deploy a ‘walk on’ fabric decking system. The decking system was created using a membrane, which was tethered to our steelwork, and then tightened using a ratchet system, to create a working platform that was safe and practical. 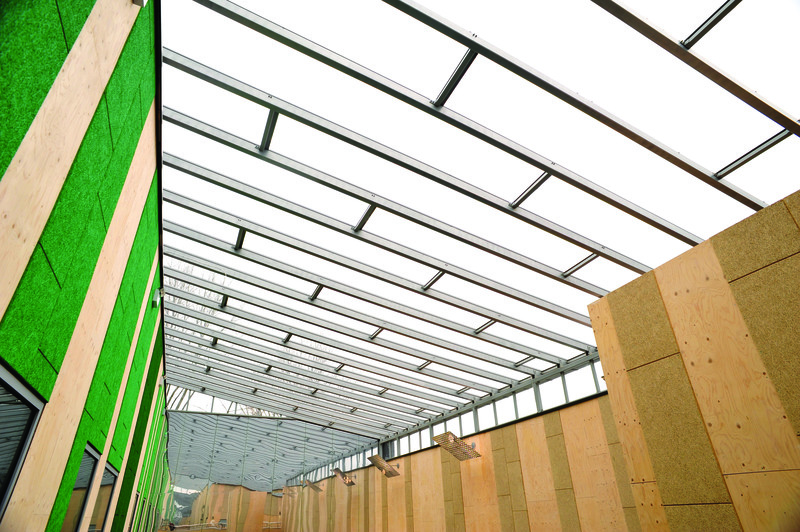 This platform allowed for the glazing to be fitted quickly and efficiently. 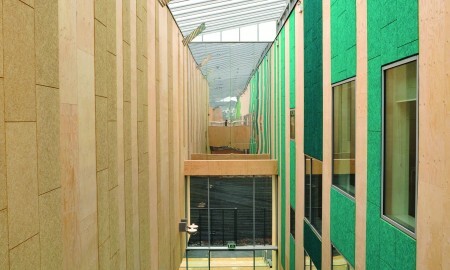 A total of 10 weeks was required to complete the ‘Atrium Roof’ works. Preceding this, 7 weeks was sufficient to complete all design, approval, procurement and manufacturing tasks. Broxap was also awarded the subcontract (sum circa £118,000) to undertake the Main Contractors Architectural Metalwork requirements. 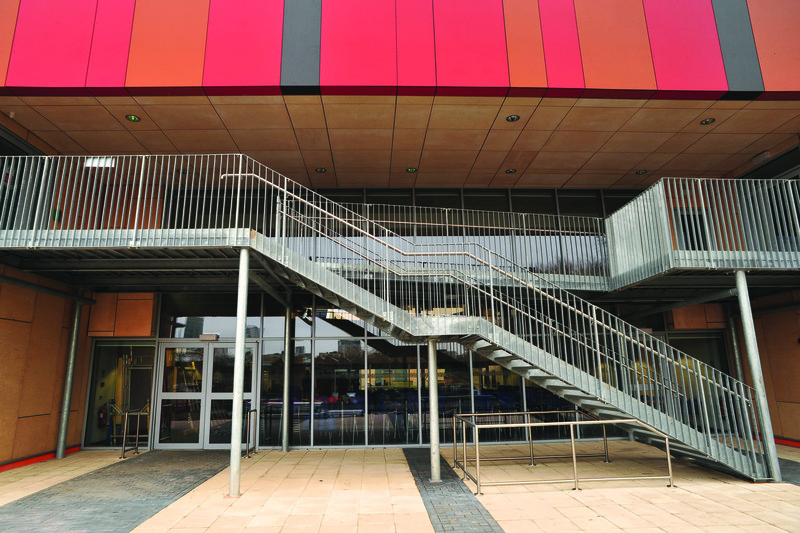 This involved the complete design, manufacture and installation of a rooftop maintenance/access walkway, a fire escape gantry and staircase at the rear of the academy, GRP grating soffits to each entrance and stainless steel balustrade to the main stairwells. The ‘core works’, also involved Broxap designing, manufacturing and installing 195m of bespoke polished stainless steel capping to the feature staircase and atrium terraces. 90m of the capping also had an architectural ‘feature’ rail system incorporated. To complete the metalworks, Broxap had to coordinate various differing works concurrently. Also, the nature of the build required that some components needed to be measured or manufactured on site, to accommodate minor discrepancies within the building structure. These works were immediately preceding the practical completion of the project, and as such there was a considerable amount of pressure to complete the works in a timely manner, and to the high standards that Broxap deliver. The work was completed to the highest standards and requirements in a period of 6 weeks, which was in line with the Main Contractors target date for practical completion.